Jason Ballweber & Elise Langer. Photo by Woodford Sisters Photography. 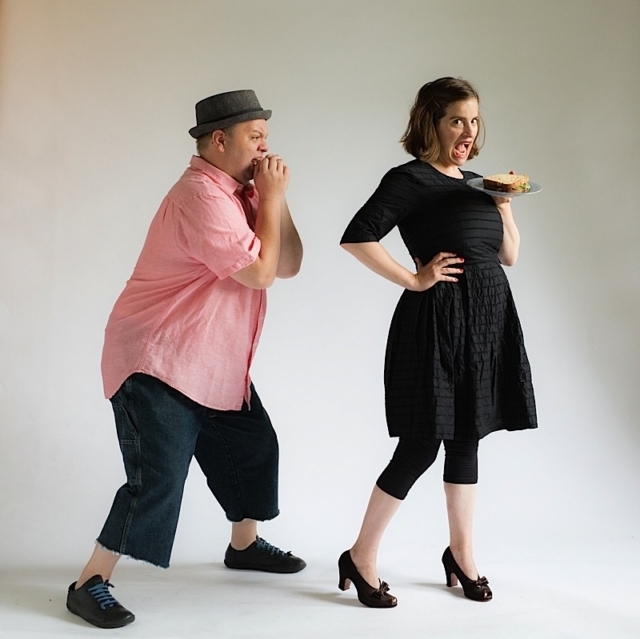 Imagine a Mack Sennett version of a Basil Dearden film thriller and you might come up with something like Richard Bean’s uproariously madcap stage comedy, One Man, Two Guvnors, at Osseo’s Yellow Tree Theatre. Set in Brighton, the English coastal resort destination, 1963, this fab production probably has more surprising twists and turns than you’ve seen in recent years. Not to mention it may be one of the silliest shows you’ll ever see. And I mean that as high praise. The gifted Jason Ballwebber shines as Francis, as he recklessly navigates all kinds of saucy shenanigans as the servant of two masters who make demands on him to be fulfilled at same time. To add fuel to the fire, Francis must keep his double life as an employee hidden from his employers. He is torn between a British gangster syndicate and pompous upper-class Englishman. And as if that wasn’t enough, things are even more complicated because Francis is as driven by his appetite for food as he is by his intimidating employers. This makes for some hilarious sight gags. Bean has created a farcical gem where rational thought is turned on its head and you sit on the edge of your seat wondering it the wrong person will come through an entrance and expose the whole zany morass. This hilarious tension is brilliantly masterminded by director Anne Byrd. Marika Proctor teases and delights in a crossgender turn. Sam Landman embodies the gangster film-noir tough guy prototype with satirical pluck. The sterling ensemble embraces and re-creates the early ’60s look, style, and movement: Warren C. Bowles, Elena Glass, Neal Skoy, Peter Simmons, Ryan Lear, Tristan Tifft, and Brant Miller. All are effectively costumed by Sarah Bahr. We all need a good laugh and there is no better show than this one to make that happen. One Man, Two Guvnors is clearly one wildcat of comedy. Inspired by Carl Goldoni’s 1746 Commedia Dell’Arte farce, A Servant of Two Masters. Yellow Tree and Bean’s joyously contemporary take on that classic is not to be missed. And may be on its way to being a classic in its own right. Note: One Man, Two Guvnors premiered in 2011 at the National Theatre of Great Britain.